and Arkansas. This plant has white flowers in summer that can be between 4 to 7 inches high. The roots and rhizomes of black cohosh have long been used medicinally by Native to treat gynecological and other disorders, including sore throats, kidney problems, and depression. Extracts from these plant materials are thought to possess analgesic, sedative, and anti-inflammatory properties. Some physiological effects of black cohosh extracts, it was originally thought these effects were solely due to estrogen compounds. up to six months. Clinical results show improvement in sweating, headache, vertigo, heart palpitations, tinnitus, nervousness, irritability, sleep disturbance, anxiety and depression. No studies exist on long-term safety of black cohosh use in humans. 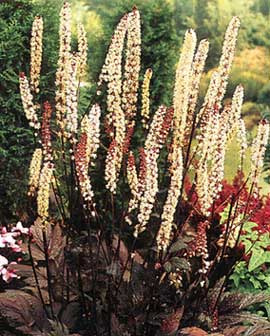 Liver damage has been reported in a few individuals using black cohosh. No studies of blackcohosh have not conclusively shown the herb causes liver damage. Side-effects also include dizziness, headaches, seizures, diarrhea, nausea and vomiting, sweating, constipation, low blood pressure and slow heartbeats and weight problems. Homeopathic usage of this herb has not shown any side effects either.